Olivia MFSK is an amateur radioteletype protocol designed to work in difficult (low signal-to-noise ratio plus multipath propagation conditions on shortwave bands. The typical Olivia signal is decoded when the amplitude of the noise is over ten times that of the digital signal! It is commonly used by amateur radio operators to reliably transmit ASCII characters over noisy channels using the high frequency (3-30 MHz, HF) spectrum. Olivia modes are commonly referred to as Olivia X / Y (or, alternatively, Olivia Y / X ), where X refers to the number of different audio tones transmitted and Y refers to the bandwidth in hertz over which these signals are spread. Examples of common Olivia modes are 16/500, 32/1000 and 8/250. The protocol was developed at the end of 2003 by Pawel Jalocha. The first on-the-air tests were performed by two radio amateurs, Fred OH/DK4ZC and Les VK2DSG on the Europe-Australia path in the 20-meter amateur band. The tests proved that the protocol works well and can allow regular intercontinental radio contacts with as little as one-watt RF power. Since 2005 Olivia has become a standard for digital data transfer under white noise, fading and multipath, flutter (polar path) and auroral conditions. The Facebook group is dedicated to instant communication for spotting, scheduling, and so on please join this group, and the Facebook group, if you are on Facebook. Since Olivia signals can be decoded even when received signals are extremely weak, (signal to noise ratio of -14db), signals strong enough to be decoded are sometimes below the noise floor and therefore impossible to search for manually. As a result, amateur radio operators have voluntarily decided upon channelization for this mode. This channelization allows even imperceptibly weak signals to be properly tuned for reception and decoding. By common convention amateur stations initiate contacts utilizing 8/250, 16/500, or 32/1000 configuration of the OLIVIA mode and then switch to other configurations to continue the conversation. The following table lists the common center frequencies used in the amateur radio bands. It is often best to get on standard calling frequencies with this mode because you can miss a lot of weak signals if you don't. However, with Olivia activity on the rise AND all the other modes vying for space, a good deal of the time you can operate wherever you can find a clear spot--as close as you can to a standard calling frequency. Note: some websites publish frequencies in this band, frequencies that are right on top of weak-signal JT65 and JT9 segments. DO NOT QRM weak-signal QSOs! We (active Olivia community members) suggest 8/250 as the starting settings when calling CQ on the USB frequencies designated as “Calling Frequencies.” A Calling Frequency is a center frequency on which you initially call, “CQ…” and then, with the agreement with the answering operator, move to a new nearby frequency, changing the number of tones and bandwidth at your discretion. Even though 8/250 is slow, the CQ call is short. But, it is narrow, to allow room for other QSOs nearby. 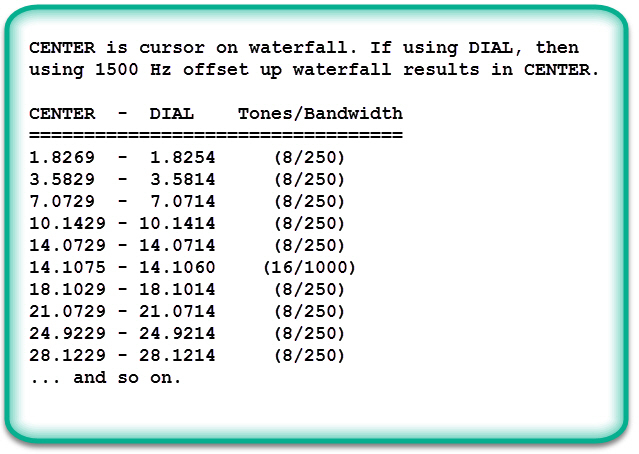 These are suggested frequencies on which can be found WEAK (i.e., a signal that you cannot hear, a signal not seen on the waterfall) Olivia signals. While it is easy to spot a STRONG Olivia signal anywhere on the waterfall, by using these suggested calling frequencies at least once and a while, you will enable us to find your signal when the signal is too weak to hear and too faint to see on the waterfall. Olivia can do well with weak signals. Yes, our suggested 8 tone with 250 Hz bandwidth results in slow transmissions. But, it is one of the better settings when attempting to decode very weak signals. Once you make contact, you can move up or down a bit, away from the calling frequency, and then change to 16/500 to make the conversation go faster. But, on a calling frequency, it is advisable to configure operations in such a way as to increase the likelihood that you will find and decode that weak signal. In the following list, CENTER is where you place the center of the software's cursor, and click to select that center frequency on the waterfall. If you use the DIAL frequency from this list, then click 1500 Hz offset up the waterfall (1500 Hz to the RIGHT of the LEFT side of the waterfall, if your waterfall is oriented horizontally with the lowest frequency on the left). This results in the software and transceiver being correctly tuned for the CENTER frequency. The listing shows CENTER, then DIAL, then the number of tones and the bandwidth. Please share this everywhere possible, as part of our effort to rekindle the love for our conversational mode, Olivia. Do not switch to other modes without calling CQ for at least a five-minute window. It is horrid when people call CQ and change settings, modes, bandwidths, tones, every time they call CQ! TURN ON RSID (TXID and RXID in FLdigi)! Note: First, make sure that your signal does not cross into other sub-bands where weak-signal modes are active. For instance, do not have any part of your signal at 14073.5 kHz or higher, as this is the sub-band for FT8, JT65A, JT9. 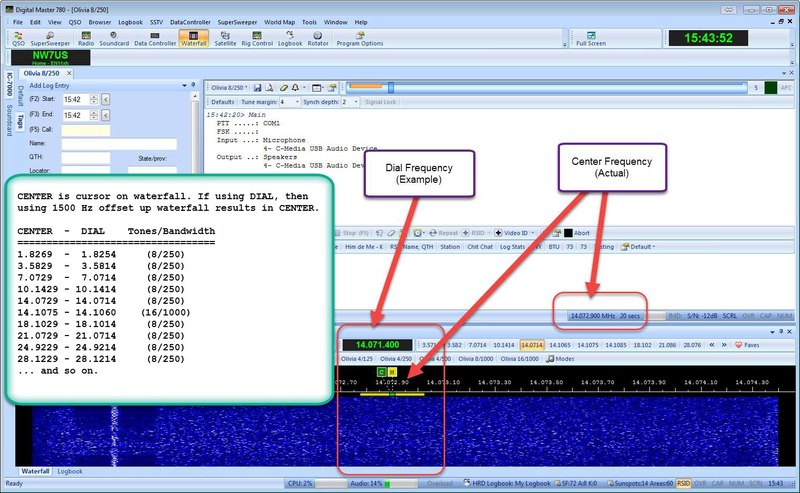 DO NOT QRM WEAK-SIGNAL MODES such as WSPR, JT65A, and JT9! BE AWARE OF THE BAND PLANS OF THOSE MODES!! 1. Please make sure you are using the RSID (Reed Solomon Identification - RSID or TXID, RXID) option in your software. RSID transmits a short burst at the start of your transmission which identifies the mode you are using. When it does that, those amateur radio operators also using RSID while listening will be alerted by their software that you are transmitting in the specific mode (Olivia, hopefully), the settings (like 8/250), and where on the waterfall your transmission is located. This might be a popup window and/or text on the receive text panel. When the operator clicks on that, the software moves the waterfall cursor right on top of the signal and changes the mode in the software. This will help you make more contacts! + NOTE: MixW doesn't have RSID features. Request it! 2. Olivia is NOT a weak-signal mode. There are no points won by barely making a contact. In USA FCC regulations, you use the power necessary to make the QSO. Typically, with poor propagation, 100w is the minimum to establish a reliable circuit. You just cannot go beyond your rig's duty cycle. You also must be sure that you do not overdrive the audio chain into your radio. Also, be sure that you do not have RF coming back into your audio chain. Yes, 100 watts is acceptable. Don't let anyone convince you otherwise. 3. Some older information that might be helpful is at this website: http://www.oliviamode.com/ -- this has older information (so do not rely on the frequencies listed! ), but most of it is STILL perfectly pertinent to the current operation. Just be aware of frequencies, and other software choices. GET ON THE AIR AND STAY AROUND FOR A WHILE, TRYING. THE RESULTING RAGCHEW COULD VERY WELL BE WORTH THE WAIT!